Round Art in the Garden is a project where geometry and botany meet in art and design. This project brings today's guest blogger, artist Morgen Bardati, into the mixed Grade 4 to 6 classroom of students at Lucerne Elementary Secondary School in New Denver, BC. 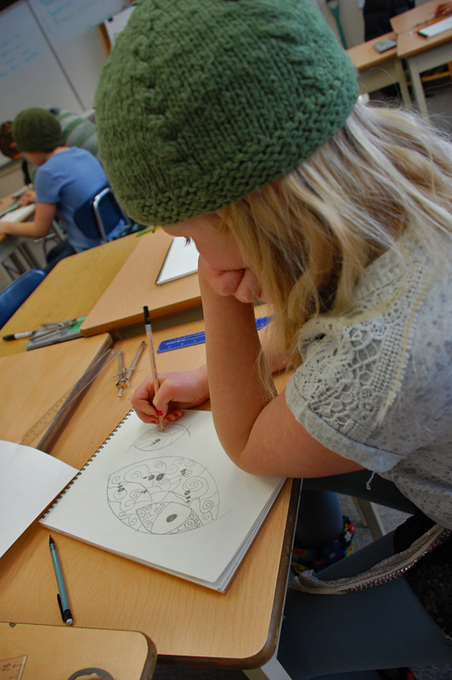 Through a series of visual art explorations of design in drawing, printmaking, textile art and earth art, students will bring their ideas together to create five mosaic mandalas for the school garden. We begin our journey indoors on a cold day in February. Our destination is the garden on a warm day in May when we will be designing, making and placing our mosaics in the school garden. 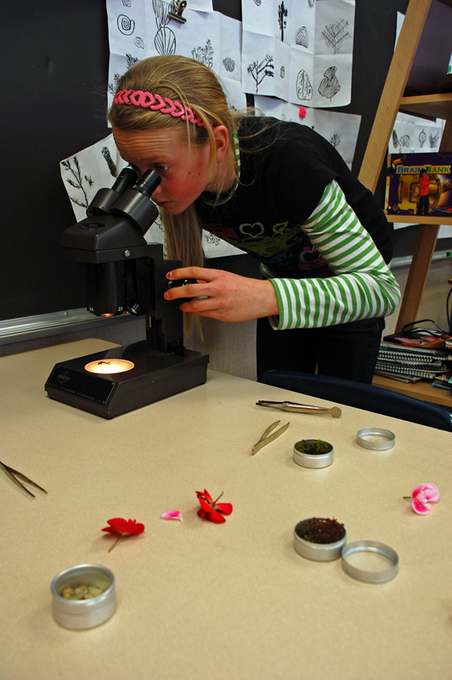 Gardening and outdoor activities are an important part of school and village culture here in the Kootenays. But first a journey through geometry and botany. Our inspiration will be experienced through circles and the geometric shapes that come out of them, patterns in nature, the geometry of flowers and seeds, and microscopic plant structures. Insights into theme are often inherent to the materials and techniques of the art forms I share with students. Art journals are an integral part of our weekly sessions. 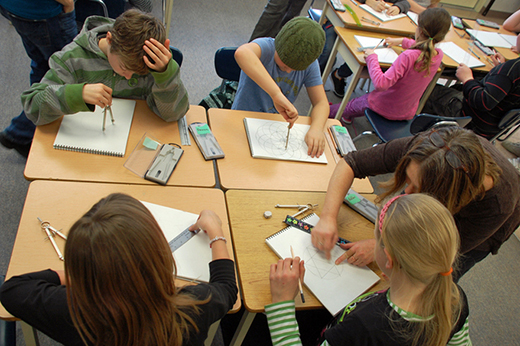 In our first two classes together we became familiar with the tools of the geometer: compass, straight edge and pencil. The compass and journals which each student received were very exciting for them and they were eager to use them. Beginning with the first point in the center of the circle, we practiced making circles around it. We imagined as we spun our circles that we were the point in the centre and the circumference was our unique view of the world. As we overlapped circles and grew shapes from the points of intersection, we imagined ourselves connecting and sharing our view and experiences with others. 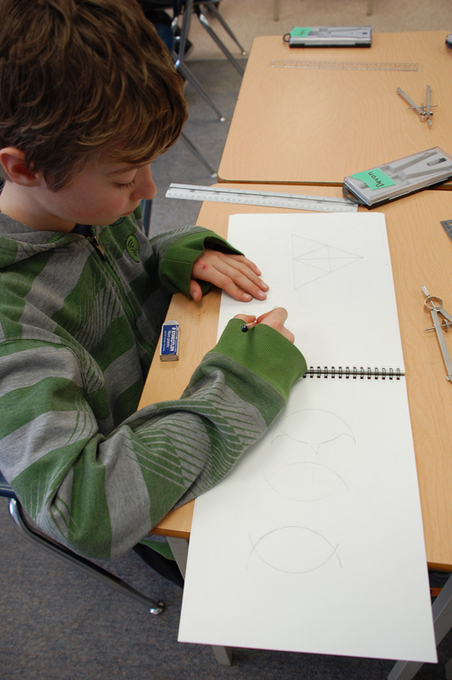 Students could see me demonstrating simple geometric drawings as I worked on an easil in front of the class. Then we would experiment with those ideas, playing with and expanding the shapes and patterns. We explored the vesica piscis, triangles and squares and learned how to recreate these shapes by multiplying, morphing and erasing parts of them into designs to use later. 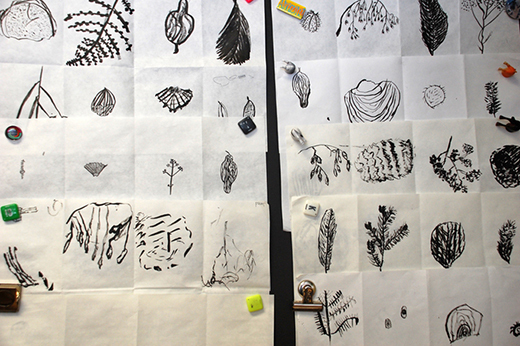 In the second part of our first two classes we worked with brush and ink, making drawings of natural objects like seeds, pinecones and finds from forests and beaches. We explored texture, pattern and the organic shapes of these objects, using and developing a toolbox of marks. We talked about variety in nature and how no two things are ever really the same, just like us. 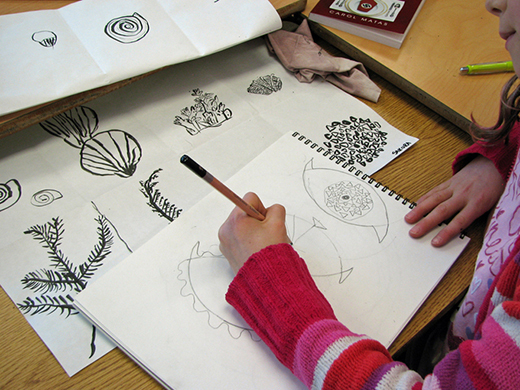 Later we started to develop designs from our drawings by combining our two themes of geometry and botany. We compared the two kinds of drawing and the tools we used to make them. The students recognized the qualities of each. 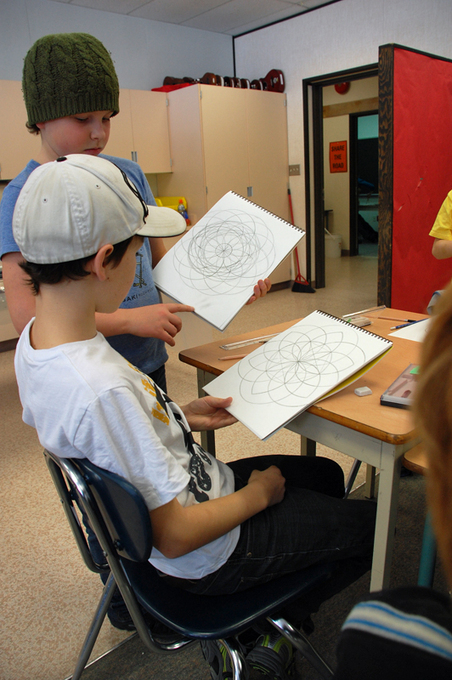 They used words like "direct, straight, organized and awesome shapes" to describe geometric drawings. They said drawing with a brush and ink was "smooth, active, detailed, free, had variety and was like doodling". They observed that you could 'fix' geometric drawings but that you could not erase or change the ink drawings. 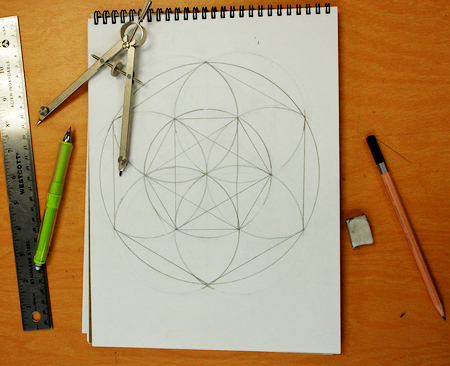 In our third class we explored the six petalled 'flower of life', six pointed star and hexagon. This was very popular with the students. One of the things to be aware of at this stage is that young students are often so impressed with these beautiful and 'perfect' shapes that it can become a challenge for them to move forward. This is when I introduce printmaking. It is a way of encouraging growth in their designs and a suggestion of ways to use them in a new and different media. 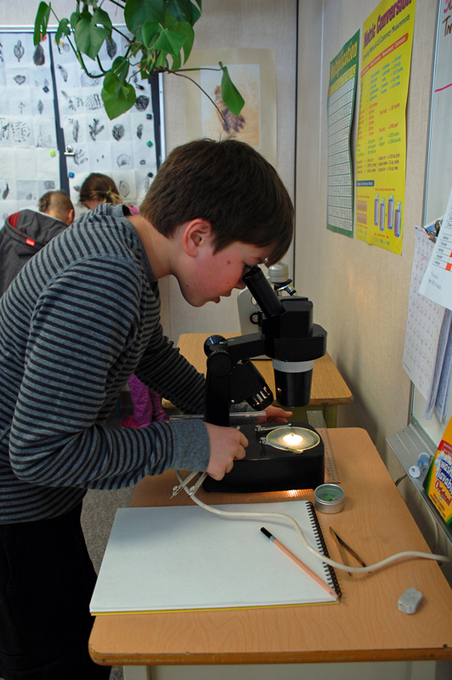 We also set up four microscopes in the classroom. 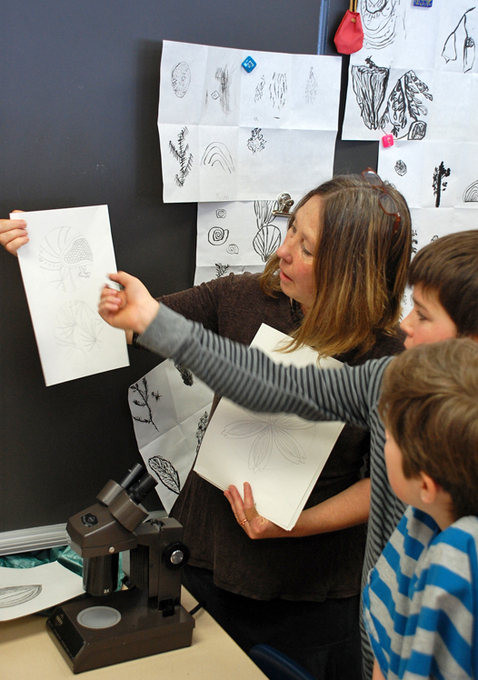 Students made drawings of seeds, flowers, moss, cactus thorns and some slides of the cross sections of stems, leaves and the roots of plants. 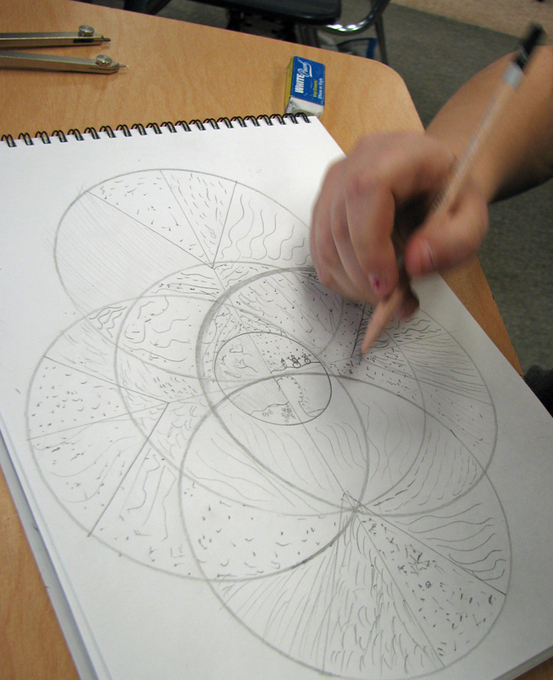 We integrated these into our geometric drawings in a variety of ways. Sometimes we used the original circle of the microscope view in the drawings and sometimes just the recurring patterns and textures. Over the next few weeks, we will try out these designs through a series of printmaking explorations. Thanks go to the incredible support in the classroom from their teacher Katrina Sumrall, support staff and volunteer helpers.